Microsoft released an online power management application designed to help you track your home energy consumption. 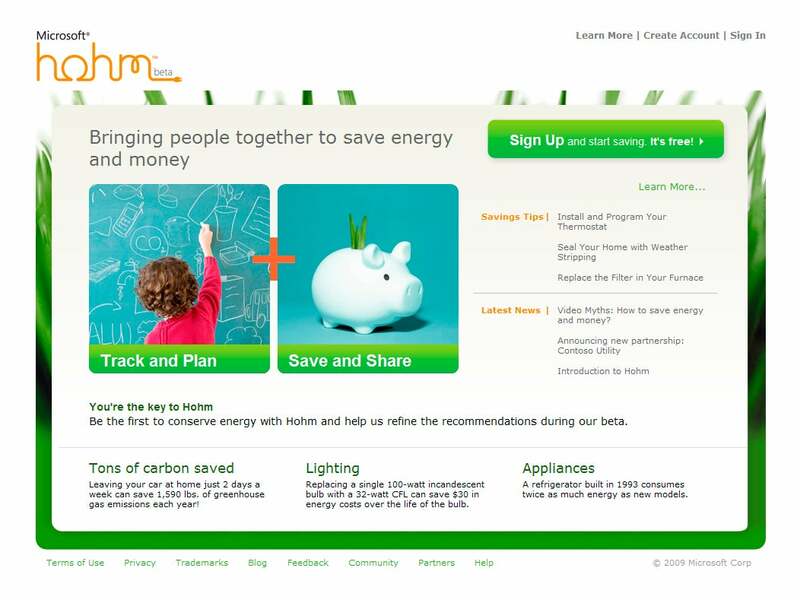 Called Hohm, the Web-based application also gives you personalized energy-saving recommendations such as placing new caulking on windows, removing air leaks, and installing a programmable thermostat. Hohm provides these suggestions based on what appliances you have, your home's specific characteristics, and your energy usage patterns. If you're uncomfortable giving too much data to Microsoft, Hohm will base its recommendations on national and local energy consumption averages. At launch, it doesn't look like Hohm will be of much help when compared to a similar service from Microsoft rival Google. When Hohm's beta service goes live, the application will focus on helping you understand your energy patterns based on a questionnaire. But Hohm won't be able to analyze actual energy consumption data from your energy provider -- something that Google's PowerMeter service can do and is doing with select energy partners already. Microsoft says consumption-tracking is coming later, and the company hopes to get into the nitty gritty of your electricity bill by providing you with information about your use of energy for heating, lighting, cooling, and appliances. Microsoft's application will also get smarter as it accumulates more data to base its recommendations on, and Microsoft is considering incorporating data from so-called smart meters in the future. While Microsoft's working to get its Hohm up and running, Google already has a similar online application to provide you with feedback on your energy usage. But unlike Hohm, Google PowerMeter will only work if your home has a smart meter to feed data to Google's application. Once your smart meter is installed, however, PowerMeter can give you all kinds of information from a history of your personal consumption (post-smart meter installation of course) to how much energy your dishwasher sucked up today. PowerMeter is also privacy conscious and Google says it won't share any personally identifying information with your energy provider. While both programs look interesting, Microsoft's Hohm may have an edge over PowerMeter, as Hohm will give you specific instructions on how to save money. Hohm will also be integrated with some social networking capabilities, allowing you to trade energy savings tips and see the usage patterns of other people in your area. Of course, it's possible Microsoft's promises won't meet reality. How, for example, will Hohm know if your windows actually need to be resealed? It sounds to me like Hohm's money-saving 'tips' will end up being general suggestions based on probable causes for any energy consumption that is higher than normal. It's hard to know for sure what Hohm entails, as Microsoft isn't providing much in the way of details at the moment. But with both Microsoft and Google in the game, energy consumption tools are definitely the next big thing in green tech. Let's just hope we don't regret handing over our energy consumption patterns to two giant corporations. Hohm is available only in the U.S, but international rollouts planned for the near future may include Germany, France, the U.K., and Canada. Google's PowerMeter is currently available in the U.S., Canada, and India in partnership with selected energy providers in each country.